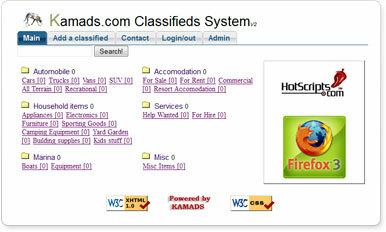 Kamads Classifieds Comes with easy setup and even easier to use features. All of the hard work is done for you, just set your categories change a few variables and it becomes branded to your website. Allows you to use as a standalone or can be include in an existing web page. Comes complete with an admin section that allows you to add modify and delete classifieds. Easily add or remove as many category's as you require. Language file include to make alternative languages easier to configure. Newest classifieds displayed on front page if required. Send to friend script included. Allows user editing of classifieds. Allows some HTML tags in classified (link ,bold,italic,underline,line break, paragraph) through easy add edit buttons. Ad space for Google Ad Sense,banners and/or advertising. Auto deletion of classifieds after predetermined expiration date. Uses CSS style sheet for easy font configuration.